Another screenshot, this time from Episode 1 of the Dirk Gently TV series1. 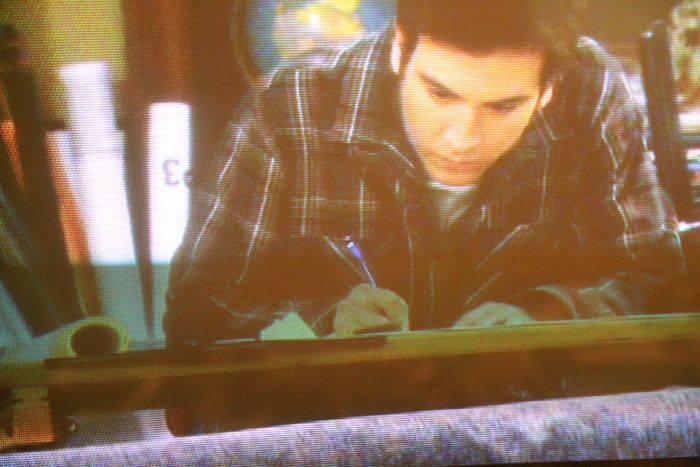 There are several pencils in this episode. One of them is easy to identify and plays an important role: it’s being used for shading paper to reveal a message. The TV series seems to be loosely based on the book, with different episodes picking up different plots from Douglas Adams’ book (at least that’s the impression I have so far, after watching the pilot and episode 1. Future episodes might be different). If you want to know more about Faber-Castell’s Grip 2001 pencils have a look at pencil talk’s review. There’s also another review at Pencil Revolution. Update: 11 March 2012: Today would have been Douglas Adams’ 60th birthday. 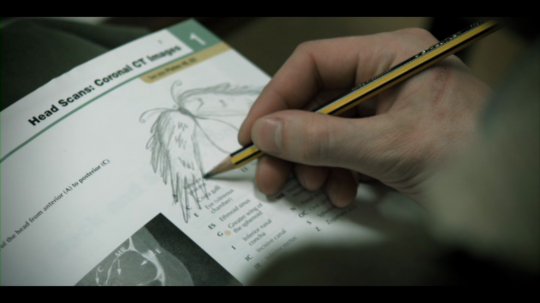 The photo of the pencil has been taken from episode 1 of the Dirk Gently TV series. 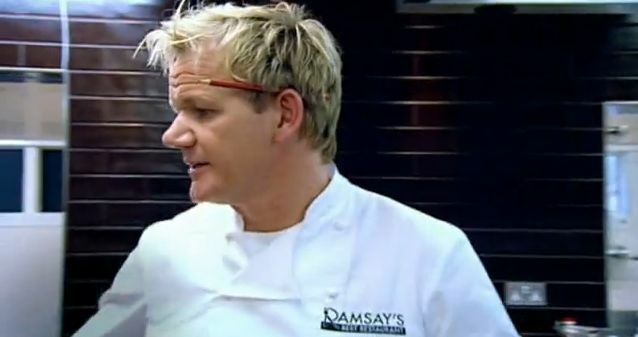 I believe that the use of this image falls under “fair dealing” as described by the UK Copyright service. It is probably superfluous to write about the Faber-Castell 1117. Not because it is a very common pencil everybody knows about, but because this pencil is not new to the blogosphere. It has previously been reviewed at penciltalk and this isn’t its first appearance at Bleistift either: the 1117 was the supporting actor in the review of the Deli pencil sharpener 0668. 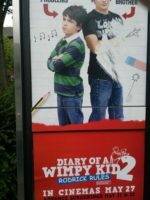 So why do I write about it again? The reason is that I thought Faber-Castell stopped producing this entry level pencil – after I was unable to buy this pencil in shops that sold this specific model previously. Before you panic: Calm down, dear. The good news is that Faber-Castell confirmed that they are still making the 1117. My guess is that the 1117 is the cheapest pencil made in Germany1. Today, you can find the version without ferrule and eraser for as little as € 0.20 (~ 28¢; 17p), if you buy them in Germany over the Internet. That’s a bit more than half the Internet price of a Staedtler Noris and about ¼ of a good Internet price for the Castell 9000. I bought the last few dozen in the local stationery shop Schreibwaren Jäcklein in my home town of Volkach when I went there in April. eraser-tipped 1117s for € 0.58 each (~ 82¢; 51p) and the untipped 1117s for € 0.36 each (~ 51¢; 32p). Last November I bought the eraser tipped 1117s in B for € 0.29 each (~ 41¢; 25p), online at Schule-Uni-Shop / CTK, but CTK do not stock the 1117 any more. This is an extremely cheap, or better: inexpensive, pencil and value for money is definitely excellent. Production of the 1117 started in 1991/1992 (20th anniversary soon!). When this pencil was first introduced it was unfinished, but for hygienic reasons later versions got a protective finish. The feel is however very similar to an unfinished pencil. Depending on your perspective this means that the pencil has a great grip or it is slightly too rough and therefore uncomfortable. The version without ferrule and eraser is available in 2B, B, HB and H. I have seen the eraser-tipped version in B and HB, but according to the label on the box the eraser-tipped version is available in five grades. All versions feature SV-bonded anti-break leads. I would like to thank Ms Schaklies from Faber-Castell for the additional information about the 1117. 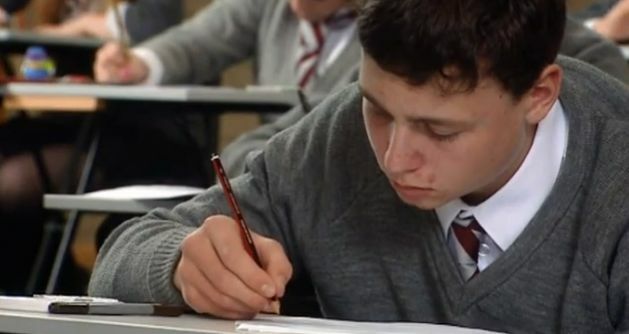 The photo of Ólafur handing over a pencil to Daníel has been taken from episode 8 of the great, Icelandic comedy Næturvaktin. I believe that the use of this image falls under “fair dealing” as described by the UK Copyright service. When it comes to the recognition value of their pencils there is one company that – in my opinion – does by far the best job: Staedtler. Compared to other companies in this industry Staedtler is quite unusual as the company belongs to the Staedtler foundation whose main purpose is the promotion of scientific research… but I digress. Let’s get back to the pencils: As much as I like to use pencils from other companies, the Faber-Castell 9000 for example, for me the archetype of a pencil is the Staedtler Noris, available in two versions: as the 120 (without eraser) and as the 122 (with eraser). The Noris is a pencil that is very common in Europe, but I would not say that it dominates the market. Noris as a brand name for pencils has been registered in 1901 and the name Noris itself is closely related to Staedtler: the nymph Noris is the personification of Nuremberg, the city where Staedtler has its headquarters. The Noris pencil is definitely quite popular in Germany. In UK it is also quite popular: in supermarkets you can usually find at least two types of pencils, often more, but a no name pencil and the Staedtler Noris seem to be the common denominator. Somehow the look of the Noris is easy to remember, but this is not a feature unique to the Noris: Staedtler also did a great job in that respect with some of their other pencils: the tradition and the Mars Lumograph. 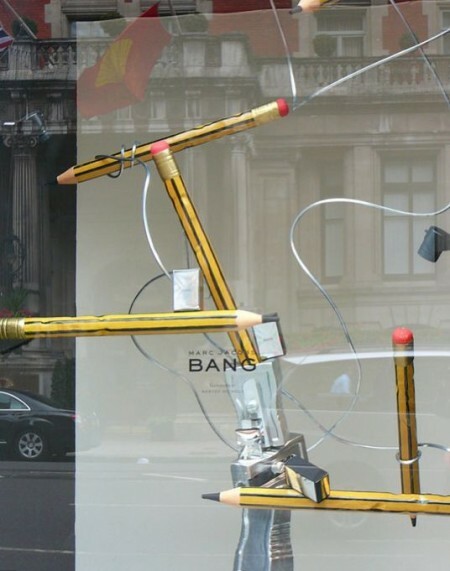 These three models are instantly recognisable and unless you count the yellow Koh-I-Noor1 they seem to be the most copied pencils in the world. The look of some of the most popular pencils in India, the Reynolds 432, the Nataraj 621 and the Doms Ajanta, seem to be based on the Staedtler tradition, as is the look of the Chunghwa 6151, reviewed at pencil talk as well as countless other copies. You can also come across the tradition in the media. 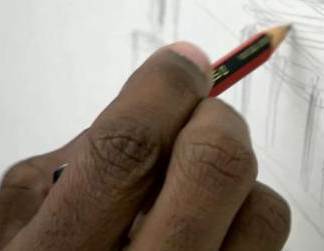 In a recent episode of Top Gear for example, Stephen Wiltshire was using a Staedtler tradition for his drawings. The Staedtler Noris was the antetype for the Chunghwa 6181, reviewed at oh! super tooth, but even though the Noris has probably been less often copied than the tradition and the Mars Lumograph, it can be seen on TV more often, usually used by somebody who is probably not even aware what make or model it is. In one episode of Black Books the main character is using a Noris to control who is allowed to talk. I just saw the Noris again last week in a BBC documentary unrelated to pencils, and I see an icon that looks like the Noris on a daily basis in Okular, the document viewer in KDE 4. Slightly younger than the Noris, with Mars being registered as a pencil brand in 1900, but with the Lumograph being released about 30 years later, the Mars Lumograph would probably have to top the list when it comes to how often the look of a pencil has been copied by no name pencils. I have seen no name pencils with the look of the Mars Lumograph, but without any writing on it countless times. Sometimes you can also see copies of this pencil with the name of the manufacturer on it, e.g. the Chunghwa Drawing pencil, reviewed at Blyantsiden (Google translation) or the Medicise Drawing pencil 9002. Of course the Mars Lumograph also got its fair share of TV presence. 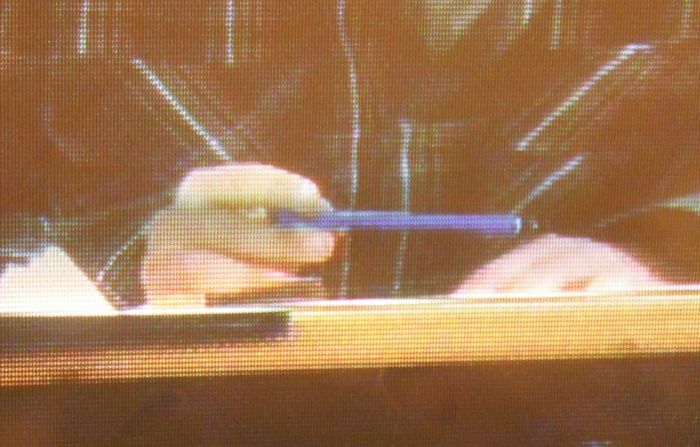 Just to name one example, there is a Derrick episode from the Seventies where a secretary is using a pencil, unmistakably a Mars Lumograph. 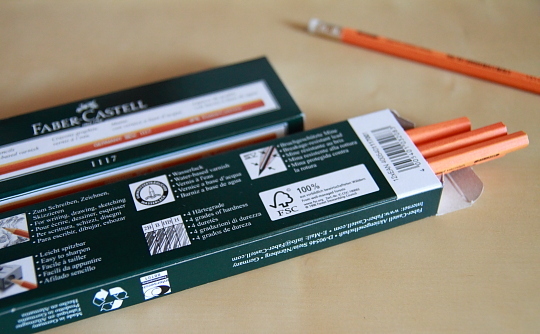 The distinct look of the Staetdler pencils makes recognising them so easy. This must surely be an important factor that influences the decision of customers when they are in front of a shelf of pencils and need to decide which pencil to buy. 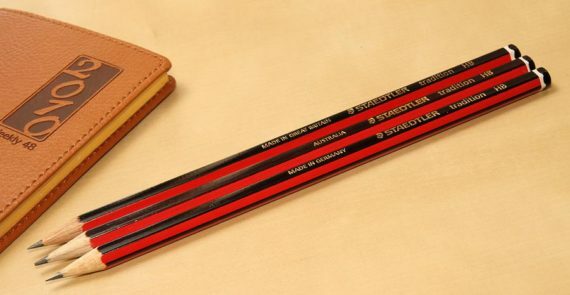 Unfortunately Staedtler stopped producing pencils in Australia and Great Britain, but some shops still have stock left that was produced in these two countries. You might know where this is going… After this really long-winded introduction I will now compare Staedtler pencils from different countries, to be more precise: I will be comparing the Staedtler tradition 110 from Australia, Germany and Great Britain. For this comparison I used recently produced pencils from the three different factories. It would be wrong to assume that there is no variation in the production, so please do not take this comparison too seriously. When comparing the different HB versions2 you can see that the Australian version has the thinnest layer of paint. I have to say that I actually like it, because you can see the texture of the wood through the paint. On a negative note I also have to add that the Australian pencils (all grades) have the paint applied less consistently. All pencils came pre-sharpened, but the pencil from the German factory has been pre-sharpened using a different method than the other pencils. 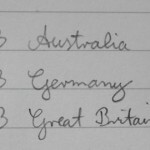 The pencil from Great Britain is definitely softer than the other two. It also smudges a bit more. When I tried to erase all three using the Mars plastic eraser pen (528 50) there was no real difference between the different pencils. 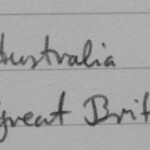 Comparing the Australian 4B and the British 4B I also thought that the British pencil was a tick softer, but this was definitely not as noticeable as it was for the HB pencils. Using the Mars plastic eraser pen the Australian 4B was maybe a bit easier to erase than the British 4B, but again there was not a big difference. Conclusion: The tradition is a really good pencil. 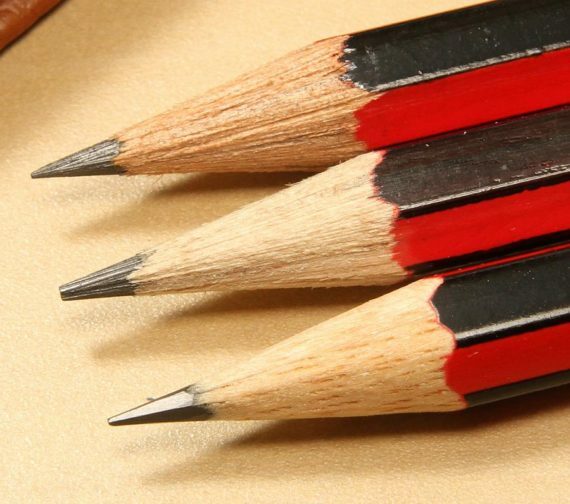 I am not sure why, but the German Staedtler web site lists the tradition in the artist category, not in the category for pencils used for writing. Nevertheless the tradition is very suitable for writing. Stock of Australian and British tradition pencils will be exhausted soon, so get some while you can …not that the performance of the German tradition is worse, but if you just spent a few minutes reading this post you must be pencil-crazy enough to want the Australian and British version as well. 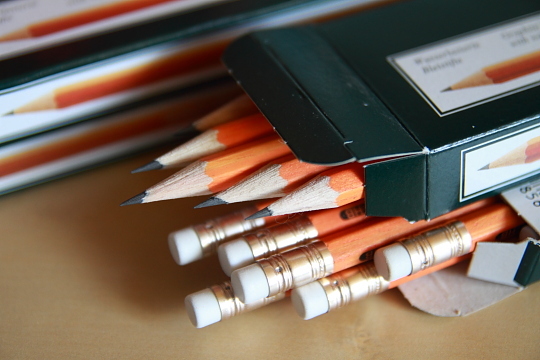 You can find a post about the Staedtler tradition at pencil talk. Kent wrote a review of the British Noris pencils at Pencilog (Google translation). You can find the English version of Staedtler’s newsletter at the Staedtler Belgium web site. You can find issue 175 of this newsletter here. Staedtler’s web site has an informative PDF about wood-cased pencils. Lexikaliker wrote a post about the colour coding used for the Noris pencils (Google translation). I would like to thank David from Dave’s Mechanical Pencils for the selection of Australian pencils, including the Staedtler tradition, he sent me. 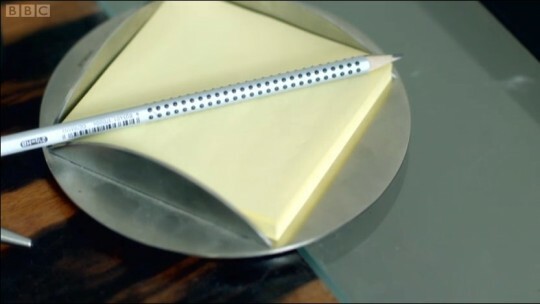 The photo of Stephen Wiltshire using a Staedtler Tradition has been taken from Top Gear Episode 5 of Series 14. 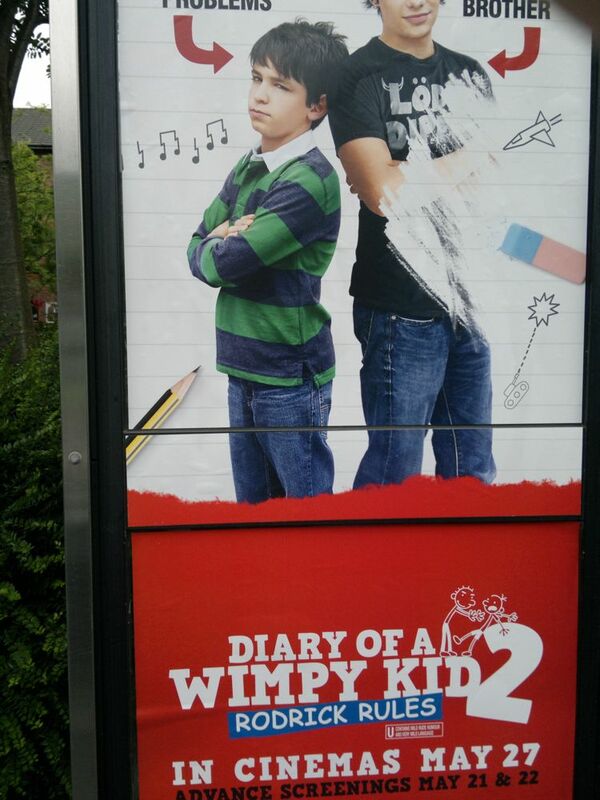 I believe that the use of this image falls under “fair dealing” as described by the UK Copyright service. The pencil icon has been taken from Okular, the document viewer in KDE 4.